The primary framework adopted for the challenge is a solution which can be easily inserted into the existing urban fabric in order to increase capacity of housing stock with the most efficient use of land and materials. The site selected to demonstrate this affordable housing design solution is a car park off Abercrombie Street in Chippendale. The concept residential structure is conceived as a prefabricated structure that can be inserted on to the site without disrupting the operations of the parking lot beneath it. Open air, on-grade car parking is located in various areas within the urban fringe. It is envisioned that these pockets of underutilised space can be temporarily used to host a small infill housing community until the land is later developed or re-purposed in the future. 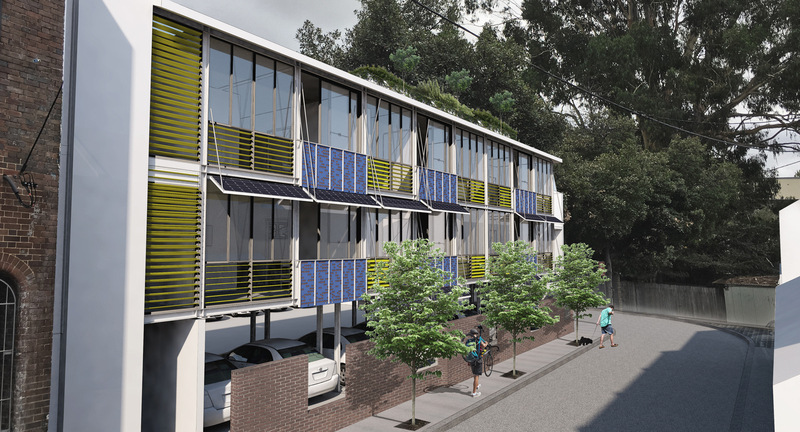 The cost of developable land for affordable housing is one of the major challenges in Sydney, so this submission describes a sharing opportunity for landowners to lease the use of their air space above a car park.